GHOULIES: From Little Puppets, Big Empires Grow – Schlockmania! As Charles Band moved into the ’80s, he sought to establish himself as an indie genre-flick producer with his outfit Empire Films. His key early success with Empire was Ghoulies, an oddball little horror flick aimed at younger teens that became a surprise hit. It went on to spawn a line of sequels that continued into the mid-’90s, helping establish the Empire brand as Band began to crank out flicks right and left. However, despite the “Gremlins knock-off” title and advertising, it’s not the mini-monster flick it might seem to be. 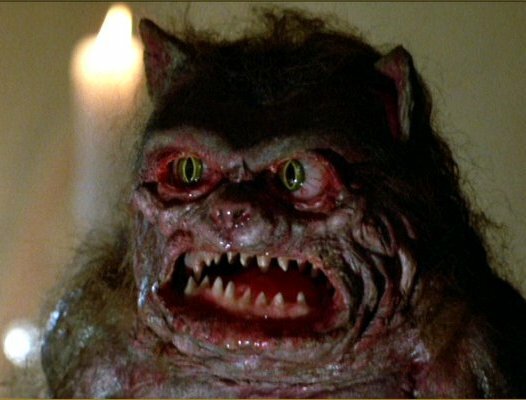 Instead, Ghoulies is a riff on black magic and possession tales that just happens to feature some pint-sized monsters (in fairness to its creators, it was developed independently of Gremlins and actually shot around the same time as that film). The protagonist is Jonathan (Peter Liapis), a young man who inherits a creepy manse from a family member he never knew. This is a surprise for him, as he grew up an orphan. The house quickly begins to take hold of Jonathan’s will, inspiring him to taking up black magic despite the disapproval of his girlfriend Rebecca (Lisa Pelikan). 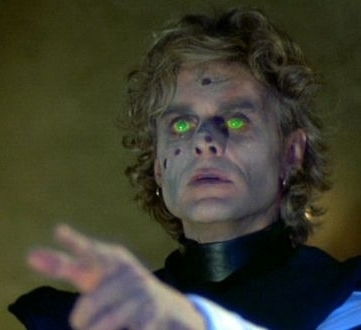 Jonathan’s dabblings in dark magic unleash the title beasties – and a ghost of a sorcerer (Michael Des Barres) with sinister motives who represents a key to Jonathan’s unknown past. Ghoul ies shapes up as a modest but hard-working horror programmer, offering a bevy of cheap thrills that step up to but never cross over the PG-13 line. The script, penned by director Luca Bercovici with Jefery Levy, suffers some lulls in its midsection but is smart enough to throw in special effects moments throughout the running time to keep the audience going. Liapis and Pelikan make solid leads, Des Barres is charmingly hammy as the spectral villain and David Lynch fans will be amused to see Jack Nance turn up as a creepy caretaker-with-a-secret. It’s also worth noting there is an early turn by Mariska Hargitay as one of the lead couple’s friends. Bercovici’s straightforward direction benefits from a big assist by a group of quality technicians, which is a hallmark of Empire flicks from this era. Sleek photography by Empire regular Mac Ahlberg gives the film a professional, atmospheric look and a jaunty orchestral score by Richard Band and Shirley Walker cements the film’s campy tone in a way that predicts the style Danny Elfman would have great success with. The key element of Ghoulies for ’80s horror fans is the final half-hour, which dishes up plenty of attacks by the titular creatures and a warlock battle. John Buechler’s creature designs are goofy, often resembling slightly sinister muppets, but they fit the film’s teen-friendly tone. 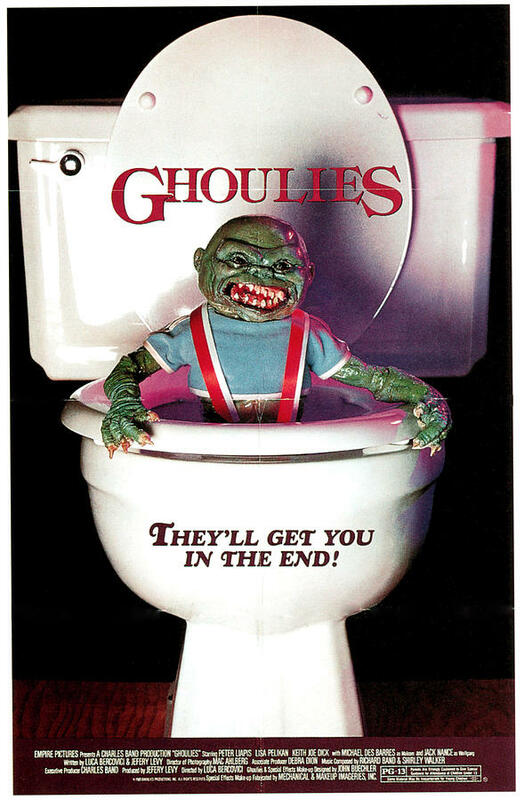 In short, Ghoulies is an interesting example of an Empire programmer, packed with budget-conscious cheap thrills aimed at ’80s-era monster kids. Its appeal might elude modern horror fans but those who can appreciate the oddball, try-whatever ethos of Empire Films will find it diverting in a low-key sort of way.